On a warm Saturday morning Oso and Tanith accompanied me outside for a bit of play, fresh air and gardening. I took down the gate blocking off the under porch storage where the gardening tools are kept and began work. Shortly I heard Oso whining and saw that he was very interested in a corner under the porch. 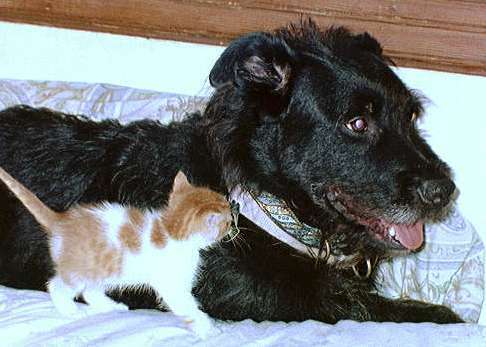 My first thought was that he had found a cat, but I heard no hissing and spitting. Oso backed off and simply stared when I came to investigate. I put him inside the house, then thought rat? I gingerly pulled aside a few boards prepared to jump aside. I should have known that whine of Oso's. Moving that last board revealed . . . . kittens! 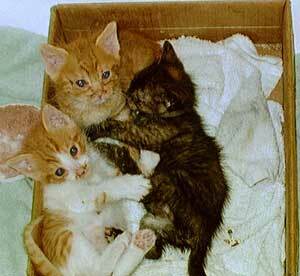 Four tiger striped kittens in various shades of orange, about three weeks old. Oso was very pleased when I scooped them up and brought them inside. 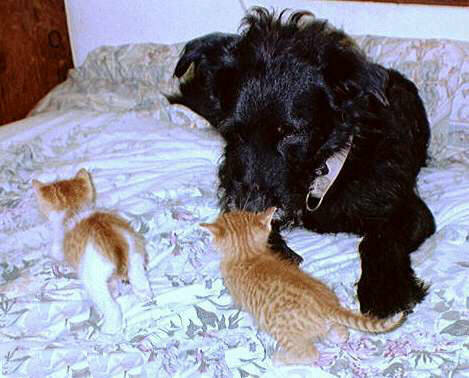 If anything has ever distracted Oso on a visit it has been his adoration of kittens. For the next couple of weeks Oso hovered near by when I cared for them. 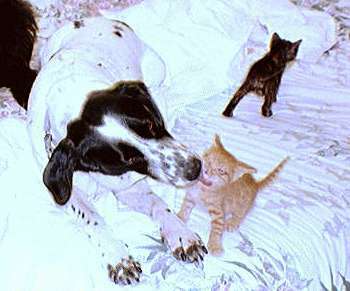 For short periods each evening the dogs relaxed on the bed serving as hills for the kittens to climb. Later the kittens learned to climb the baby gate and Oso would announce their escape with a whine. 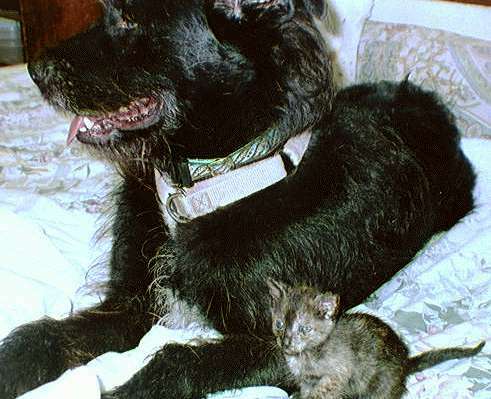 I would find him standing over one kitten nudging it back with his nose, while keeping his eye on a second escapee. The night after I took the kittens to their new foster home Oso stood and stared into the empty bathroom and sighed.